I wrote a quick demo that shows how to create a web app that fetches the starred items for a Spotify user via the nifty new Spotify Web API. The demo will first solicit permission from the user, and if the user grants such permissions, the app will then retrieved the starred list and show the tracks in a simple list. The online demo is here: My Starred Items. The source is on github. Going to a show? Not totally familiar with an artist’s catalog? Give The Set Listener a try. The Set Listener is a web app that will create a Spotify playlist of an artist’s most recent show. The app relies on the SetList.fm API and the brand new and super spiffy Spotify Web API. Now that the Spotify Web API supports the creation and saving of playlists creating these types of apps is quite straightforward – just a few hours of coding. This was my first time using the SetList.fm API – its a super resource for setlists from concerts by thousands of artists. Check out the app online at The Set Listener. The code is online on github. Last week at the SXSW Music Hack Championship hackathon I built The Autocanonizer. An app that tries to turn any song into a canon by playing it against a copy of itself. In this post, I explain how it works. The goal of the Autocanonizer is to fold a song in on itself in such a way that the result still sounds musical. To do this, we use The Echo Nest analyzer and the jremix library to do much of the heavy lifting. First we use the analyzer to break the song down into beats. Each beat is associated with a timestamp, a duration, a confidence and a set of overlapping audio segments. An audio segment contains a detailed description of a single audio event in the song. It includes harmonic data (i.e. the pitch content), timbral data (the texture of the sound) and a loudness profile. Using this info we can create a Beat Distance Function (BDF) that will return a value that represents the relative distance between any two beats in the audio space. Beats that are close together in this space sound very similar, beats that are far apart sound very different. The BDF works by calculating the average distance between overlapping segments of the two beats where the distance between any two segments is a weighted combination of the euclidean distance between the pitch, timbral, loudness, duration and confidence vectors. The weights control which part of the sound takes more precedence in determining beat distance. For instance we can give more weight to the harmonic content of a beat, or the timbral quality of the beat. There’s no hard science for selecting the weights, I just picked some weights to start with and tweaked them a few times based on how well it worked. I started with the same weights that I used when creating the Infinite Jukebox (which also relies on beat similarity), but ultimately gave more weight to the harmonic component since good harmony is so important to The Autocanonizer. The next challenge, and perhaps biggest challenge of the whole app, is to build the canon – that is – given the Beat Distance Function, create two audio streams, one beat at a time, that sound good when played simultaneously. The first stream is easy, we’ll just play the beats in normal beat order. It’s the second stream, the canon stream that we have to worry about. The challenge: put the beats in the canon stream in an order such that (1) the beats are in a different order than the main stream, and (2) they sound good when played with the main stream. It’s a rat’s nest of connections, very little structure is evident. You can listen to what it sounds like by clicking here: Experimental Rat’s Nest version of Someone Like You (autocanonized). It’s worth a listen to get a sense of where we start from. So why does this bounce all over the place like this? There are lots of reasons: First, there’s lots of repetition in music – so if I’m in the first chorus, the most similar beat may be in the second or third chorus – both may sound very similar and it is practically a roll of the dice which one will win leading to much bouncing between the two choruses. Second – since we have to find a similar beat for every beat, even beats that have no near neighbors have to be forced into the graph which turns it into spaghetti. Finally, the underlying beat distance function relies on weights that are hard to generalize for all songs leading to more noise. The bottom line is that this simple approach leads to a chaotic and mostly non-musical canon with head-jarring transitions on the canon channel. We need to do better. You can see bundles of edges leaving section 3 bound for section 5 and 6. We could use these bundles to find most similar sections and simply overlap these sections. However, given that sections are rarely the same length nor are they likely to be aligned to similar sounding musical events, it is unlikely that this would give a good listening experience. However, we can still use this bundling to our advantage. Remember, our goal is to find a good coherent sequence of beats for the canon stream. We can make a simplifying rule that we will select a single sequence of beats for the canon stream to align with each section. The challenge, then, is to simply pick the best sequence for each section. We can use these edge bundles to help us do this. For each beat in the main stream section we calculate the distance to its most similar sounding beat. We aggregate these counts and find the most commonly occurring distance. For example, there are 64 beats in Section 3. The most common occurring jump distance to a sibling beat is 184 beats away. There are ten beats in the section with a similar beat at this distance. We then use this most common distance of 184 to generate the canon stream for the entire section. For each beat of this section in the main stream, we add a beat in the canon stream that is 184 beats away from the main stream beat. Thus for each main stream section we find the most similar matching stream of beats for the canon stream. This visualizing shows the corresponding canon beat for each beat in the main stream. This has a number of good properties. First, the segments don’t need to be perfectly aligned with each other. Note, in the above visualization that the similar beats to section 3 span across section 5 and 6. If there are two separate chorus segments that should overlap, it is no problem if they don’t start at the exactly the same point in the chorus. The inter-beat distance will sort it all out. Second, we get good behavior even for sections that have no strong complimentary section. For instance, the second section is mostly self-similar, so this approach aligns the section with a copy of itself offset by a few beats leading to a very nice call and answer. That’s the core mechanism of the autocanonizer – for each section in the song, find the most commonly occurring distance to a sibling beat, and then generate the canon stream by assembling beats using that most commonly occurring distance. The algorithm is not perfect. It fails badly on some songs, but for many songs it generates a really good cannon affect. The gallery has 20 or so of my favorites. When I first released my hack, to actually render the two streams as audio, I played each beat of the two streams simultaneously using the web audio API. This was the easiest thing to do, but for many songs this results in some very noticeable audio artifacts at the beat boundaries. Any time there’s an interruption in the audio stream there’s likely to be a click or a pop. For this to be a viable hack that I want to show people I really needed to get rid of those artifacts. To do this I take advantage of the fact that for the most part we are playing longer sequences of continuous beats. So instead of playing a single beat at a time, I queue up the remaining beats in the song, as a single queued buffer. When it is time to play the next beat, I check to see if is the same that would naturally play if I let the currently playing queue continue. If it is I ‘let it ride’ so to speak. The next beat plays seamlessly without any audio artifacts. I can do this for both the main stream and the canon stream. This virtually elimianates all the pops and clicks. However, there’s a complicating factor. A song can vary in tempo throughout, so the canon stream and the main stream can easily get out of sync. To remedy this, at every beat we calculate the accumulated timing error between the two streams. If this error exceeds a certain threshold (currently 50ms), the canon stream is resync’d starting from the current beat. Thus, we can keep both streams in sync with each other while minimizing the need to explicitly queue beats that results in the audio artifacts. The result is an audio stream that is nearly click free. 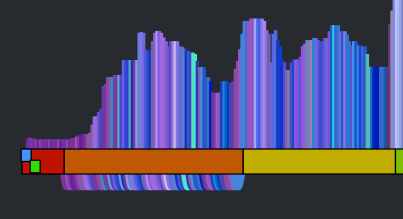 It showed the beats lined up in a row, colored by the timbral data. The two playback streams were represented by two ‘tape heads’ – the red tape head playing the main stream and the green head showing the canon stream. You could click on beats to play different parts of the song, but it didn’t really give you an idea what was going on under the hood. In the few days since the hackathon, I’ve spent a few hours upgrading the visualization to be something better. I did four things: Reveal more about the song structure, show the song sections, show, the canon graph and animate the transitions. The colored bars don’t really tell you too much about the song. 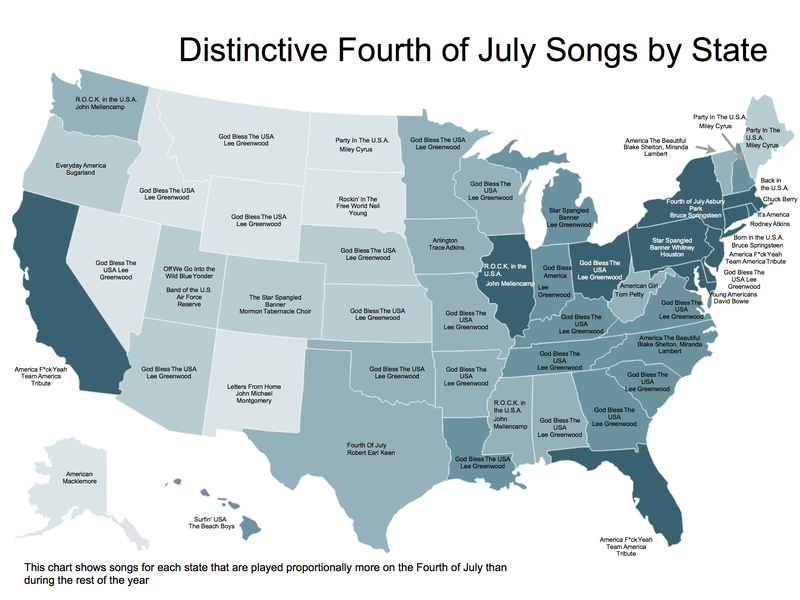 With a good song visualization you should be able to tell the difference between two songs that you know just by looking at the visualization. In addition to the timbral coloring, showing the loudness at each beat should reveal some of the song structure. Here’s a plot that shows the beat-by-beat loudness for the song stairway to heaven. The noise is gone, but we still have all the nice sharp edges. Now there’s enough info to help us distinguish between two well known songs. See if you can tell which of the following songs is ‘A day in the life’ by The Beatles and which one is ‘Hey Jude’ by The Beatles. Which song is it? Hey Jude or A day in the Life? As part of the visualization upgrades I wanted to show the song sections to help show where the canon phrase boundaries are. To do this I created a the simple set of colored blocks along the baseline. Each one aligns with a section. The colors are assigned randomly. Show the canon graph and animate the transitions. To help the listener understand how the canon is structured, I show the canon transitions as arcs along the bottom of the graph. When the song is playing, the green cursor, representing the canon stream animates along the graph giving the listener a dynamic view of what is going on. The animations were fun to do. They weren’t built into Raphael, instead I got to do them manually. I’m pretty pleased with how they came out. All in all I think the visualization is pretty neat now compared to where it was after the hack. It is colorful and eye catching. It tells you quite a bit about the structure and make up of a song (including detailed loudness, timbral and section info). It shows how the song will be represented as a canon, and when the song is playing it animates to show you exactly what parts of the song are being played against each other. You can interact with the vizualization by clicking on it to listen to any particular part of the canon. Wrapping up – this was a fun hack and the results are pretty unique. I don’t know of any other auto-canonizing apps out there. It was pretty fun to demo that hack at the SXSW Music Hack Championships too. People really seemed to like it and even applauded spontaneously in the middle of my demo. The updates I’ve made since then – such as fixing the audio glitches and giving the visualization a face lift make it ready for the world to come and visit. Now I just need to wait for them to come.